Don’t panic about new sinking data for Venice! The new study finds that between 2000 and 2010 the city of Venice was subsiding at the rate of 1-2 mm a year, although identifies land in parts of the lagoon was subsiding at the rate of 3-4 mm a year. These measurements suggest an increase in the average rate of subsidence from 0.5 mm each year identified at the turn of the last century (Fletcher and da Mosto 2004:34). However, these new rates of subsidence are minimal compared with those experienced during most of the twentieth century. A respected study by Augusto Ghetti of Padua University (1988), found that Venice’s average rate of subsidence was 8 mm a year in 1950 and by 1969 was 17 mm at Marghera on the edge of the Venetian lagoon and 12 mm in Venice. These high rates of subsidence were principally due to the extraction of groundwater from under the Venetian lagoon, which was stopped in the 1970s when it was understood that this was causing significant subsidence. Over time, the causes of subsidence in Venice have changed and so have the rates. The CBS News article suggests the recent causes of subsidence could include the movement of teutonic plates and compacting soil under the weight of buildings. 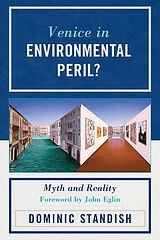 These various causes are discussed in detail in my recently published book Venice in Environmental Peril? Myth and Reality (UPA 2012). While it is important to understand the causes of sinking, the book also explains why Venice is in a stronger position to respond to sinking and flooding than it was during the high floods of 1966 or beforehand. Local defences have been built up and communications and forecasting have improved. In addition, the mobile dam project to protect Venice from very high level flooding should be completed within the next few years. There is even a project to investigate the possibility of raising Venice by pumping water into the ground under the lagoon. The city of Venice is subsiding less than many parts of coastal America, the south coast of England and the ancient Roman city of Ravenna in Italy. Venice is proving that humanity can respond to protect an important ancient city from the challenges of nature. So don’t panic about the new sinking data for Venice!